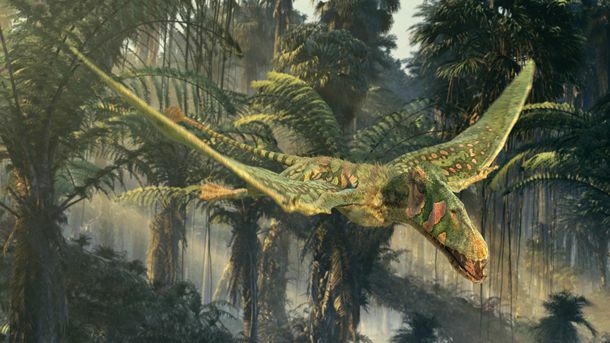 National Geographic Entertainment’s Flying Monsters 3D sets out to uncover the truth about the dinosaur cousin, the pterosaur, with a wingspan of approximately 12 meters (40 feet) and equal to that of a modern-day jet plane. Flying Monsters 3D features one of the greatest mysteries in paleontology: how and why did pterosaurs fly? How did creatures the size of giraffes defy gravity and soar through prehistoric skies? The education resources on this page invite you to connect biology and Earth science instruction with pterosaur species investigations using film clips, illustrations, and hands-on activities. Flying Monsters 3D, in theaters now, will inspire and intrigue, sparking students’ imaginations and showing that science is dynamic and happening not too far from our own backyards. Use multimedia to explore characteristics of flying and gliding in this Grade 3-8 interactive activity for Promethean whiteboards from NG Education. Bolortsetseg Minjin is the director of the Institute for the Study of Mongolian Dinosaurs. Jorn Hurum is a science educator and paleontologist who studies fossils found in Norway’s Svalbard archipelago, north of the Arctic Circle. Students differentiate between observations and hypotheses in an article about pterosaurs. They then consider how challenging and further testing hypotheses is part of the nature of science. Students group vertebrates and share their reasoning in classifying them. They compare their approach to Linnaean and modern systems in order to explore evolutionary relationships and the dynamic nature of classification. Students examine animals that are examples of convergent evolution. They then analyze wings of bats, birds, and pterosaurs to see why these animals are not closely related. Students analyze characteristics of six pterosaurs to determine the role of adaptive radiation in their evolution from a common ancestor. See pterosaurs come to life in this film that The Daily Mail called "Jurassic fantastic"! Find facts, media, and features about prehistoric animals from Nat Geo Wild. Follow the Phenomena Blog for up-to-date science articles, news and media. Dig up data on Oryctodromeus, a burrowing dinosaur from Big Sky Country. Paleontologist Paul Sereno travels the world to uncover and identify fossils. Learn more about paleontology, the study of ancient life on Earth, through reference content such as encyclopedic entries and collections. Paleontology is the study of the history of life on Earth as based on fossils. Fossils are the remains of plants, animals, fungi, bacteria, and single-celled living things that have been replaced by rock material or impressions of organisms preserved in rock. This collection contains a selection of content from NG Education about paleontology. Use search to find more.